Delighted to work with Osibisa formed in 1969, with their anthemic song Sunshine day they're as well known today as they were back then. We can work with you multi-territory with some exceptions, always worth asking and we'll do our best to bring this brilliant live band to your venue. Their vibrant African cross-rhythms brought new life to a tired rock scene, and they were one of the first bands to popularise African music in Europe, America, and the rest of the world; they've been called the Godfathers of World Music! For four decades they've been delighting audiences with their energetic fusion sound that covers everything from African, Caribbean and rock to jazz, Latin and R&B; as yet their astounding live performances show no signs of slowing down. 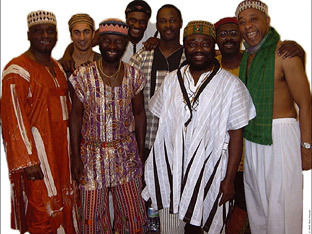 Osibisa are joyous, unstoppable, and here to stay, availability is all year round.